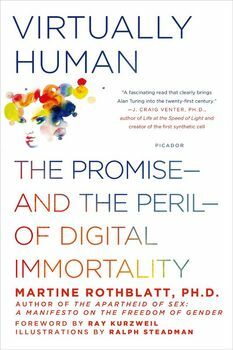 Rothblatt conveys a profound understanding of how close we are to achieving a full simulation of the human brain via software and computer technology in clear, positive language, and raises numerous ethical and moral questions we absolutely need to address now, before the technology becomes commercially viable and accessible to all of us. She gives us the philosophical and technological tools to understand the far-reaching implications of artificial intelligence. Martine Rothblatt has been at the forefront of AI research, and is a clearheaded and optimistic thinker when it comes to understanding the ethical concerns that will play a significant role as we move towards living side by side with our mindclones. Virtually Human will be the essential companion book to the future of mankind. "Martine Rothblatt has a knack for expanding our minds as well as our comfort zones beyond customary boundaries, be they of gender or substrate" (Ray Kurzweil). Virtually Human explores how cyberconsciousness will manifest in our lives, and what we need to consider when a new, high-tech population of mindclones awakens to the rights, privileges, and obligations humans take for granted.